While the idea of a rock star being behind a virtual reality viewer sounds like a gimmick put together to generate publicity, this isn’t the case with Brian May and his device. Not only is the Queen guitarist an astrophysicist and former math teacher, but he’s also the owner of the London Stereophonic Company that makes the Owl VR Smartphone kit, which he designed and patented. 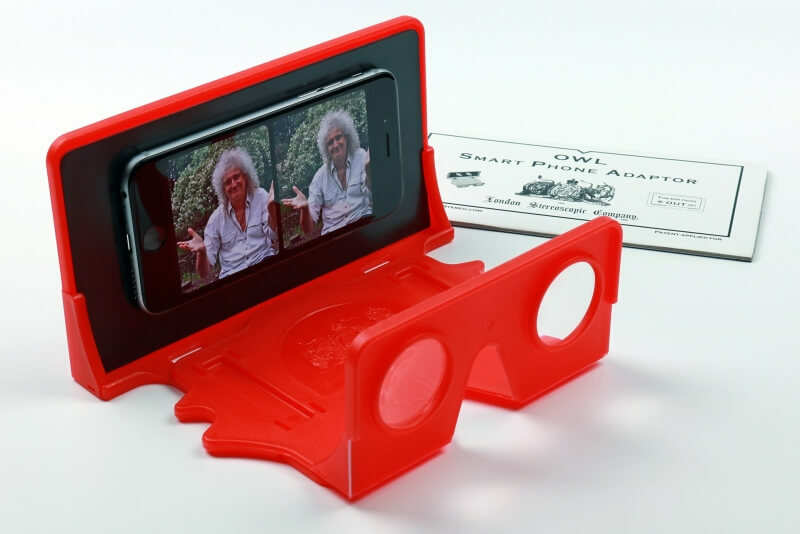 May’s polypropylene viewer is actually an update to the Owl Stereo Viewer from 2008. With this modern incarnation, the static cards are replaced with a magnetic backplate that can hold any smartphone, thanks to a sliver of metal that attaches to the back of a device. Essentially, the owl is a smarter, plastic variant of Google Cardboard. In addition to being made out of sturdier material, the kit has two other advantages over Google’s cheap and popular viewer; you can adjust the focus by sliding the panel that holds the smartphone back and forth, and the open design allows users to easily access their device. Though the latter may mean you’re sacrificing some level of VR immersion. “The reason I created the Owl was to recreate Victorian stereoscopy. People get fatigued very quickly with [other] VR devices, they get frustrated that they can’t reach their phone to get to their controls and they get sweaty with the eyepieces so I quickly realised that, in some ways, this was a better way of viewing virtual reality,” said May. A huge advocate of virtual reality, May spoke of his vision for the future of the technology to Ars Technica at the unvieling of the Owl VR. Ultimately VR will change the world, because you'll be able to build everything that you love and cherish in the virtual world. You'll feel like you can touch and hear and interact with them. VR could advance to the point where you feel a tug, a sort of nostalgia, a feeling that you've lost something, because you've fallen in love with the virtual world. Eventually, I think people won't want to come out. The Owl VR kit will be available mid-June for around $36 from the London Stereoscopic Company.